Have you ever used a map? You probably have. Maybe it was a paper one, maybe it was a road atlas, possibly on a GPS or SatNav or Google maps online. A map can tell us all kinds of information. 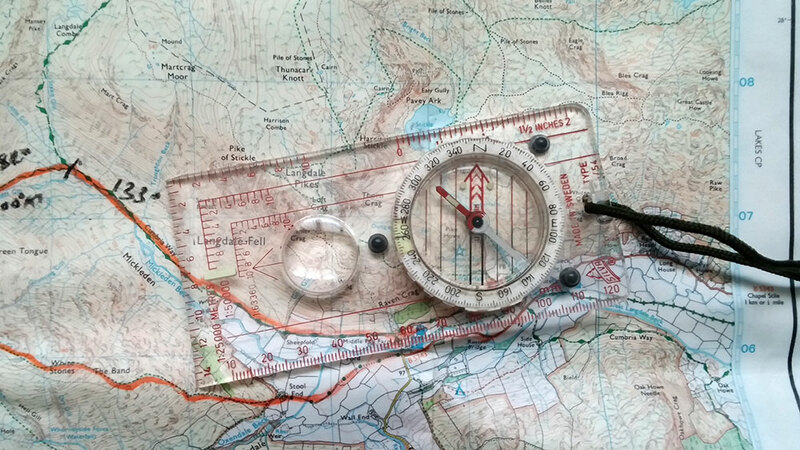 Used with a compass, a paper map can help you find your way round countryside places if used properly!! In this session we're going to look at an old paper map (of the Lake District in Cumbria, England) and see what kinds of spiritual lessons from The Bible for our Christian lives. The lessons could be learned from any map of anywhere in the world! The 'map' is going to represent the Bible. 2. 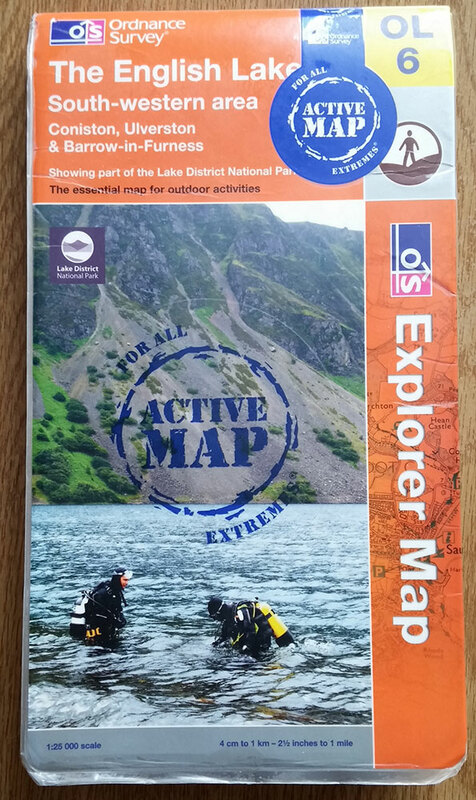 Ask around and see if anyone has a copy / copies of the Ordnance Survey map for the Lake District area 'OL6'. The bigger your group the more maps you'll need (there are cheaper places to buy a map like dash4it.co.uk - no affiliation). You can print off screen captures from streetmap.co.uk but be aware that all this material is subject to copyright. 3. Get the young people into groups and make sure they have a map or print out for each group / individual (if you have a smaller group). 4. 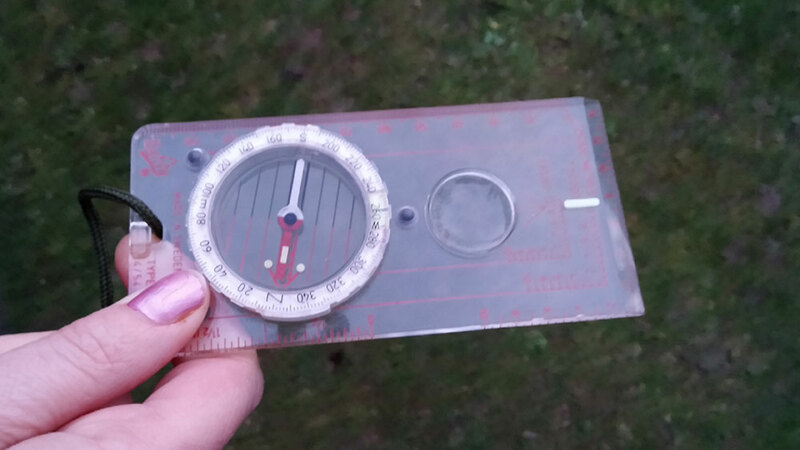 You will need as many compasses as you have maps - one for each group. Again, ask around church! 5. You may want to learn / train yourself on using a map and compass. There are plenty of good online tutorials and videos to help! On the left is a photograph of my map of the South-western of the Lake District area (OL6), made by Ordnance Survey. There are different versions of the map that you can get (normal or waterproof). 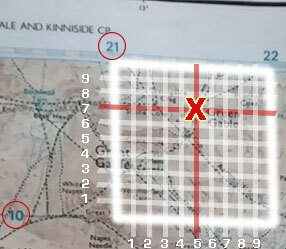 There are different 'sizes' with a 1:25,000 (1mm represents 25m on the ground) and a 1:50,000 map (1mm represents 50m on the ground) from Ordnance Survey. You can also get a 1:40,000 map from Harvey maps. Maybe you've got a few different versions of the Bible like I have. I also have different map versions for different reasons and times. Some people have different versions of the Bible for different reasons. Question - what versions of the Bible do you have? Or what versions have you heard of? Ask people or get them to shout out. What are the differences that you know about? There are lots of different versions of the Bible which you can use. Don't get hung up too much on what loud people think is the 'best' Bible. The right thing is to find a true copy of the Bible that works for you; that you can relate to; that speaks your language! Some ideas are: New International Version (NIV); New King James Version (NKJV); New Living Translation (NLT); The Message (MSG); the Amplified Version (AMP). I expect you've got a copy of the Bible on your phone or in paper copy. But I wonder what kind of condition it's in? Lots of people have a Bible in their house. It sits on a shelf or at the back of a cupboard and never sees the light of day! Other people have a Bible App on their phone but if you were to look at the last time you opened it, how long would it be? Question - When did you last really read your Bible? If you could see my map you'd see that it's a bit worn, some of the waterproof coating has come off, it's got bends in it where it's been folded up for use in bad weather etc. It is a well-used map! The same should be true of our Bibles. They should be well-used. I've got a copy of the Bible (an NIV one) which I know well - sometimes it's like I can even visualise where on a page particular verses are. This is the same as some of the places I go in the Lake District and elsewhere when I can often visualise the map. Question - what ideas do you have or can you share between you to get reading your 'map' (your Bible) more? Can you encourage each other	to help? If I want to know where I'm going in the Lake District, I need to look at the map. That means I don't just look at the cover and think 'that's a nice picture of the Wasdale Screes' (the picture on the front of my OL6 map). I actually have to open the map and find the places! That takes a bit of knowledge and a bit of understanding. On an Ordnance Survey map (OS Map), there are ways to find where you want to be or find a certain place. You can simply look around the map for the name. Or you can use what's called Grid References. The basic ones we use in the UK have 6 numbers. On an OS map, each square is divided into 1km x 1km boxes. Each of those boxes has a number going horizontally (that means left to right) and vertically (down to up). So, for example, in the picture above, the top of Green Gable is in the box with the number 21 (horizontal) and the number 10 (vertical). So a 4 digit reference would be 21,10. 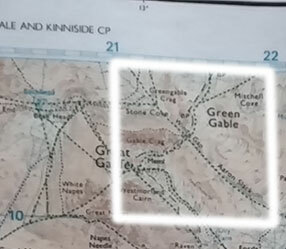 But if we want to be more specific, we could say that Green Gable (which is shown by the 'X') is about in the middle of the horizontal side and nearer the top of the vertical side. But if we divide the box into equal measures of 10 lines across and 10 lines up, we can add an extra number to our 4 digit code (which was 2110) to be 215107. This means box 21 and 5 horizontally - and box 10 and 7 vertically. 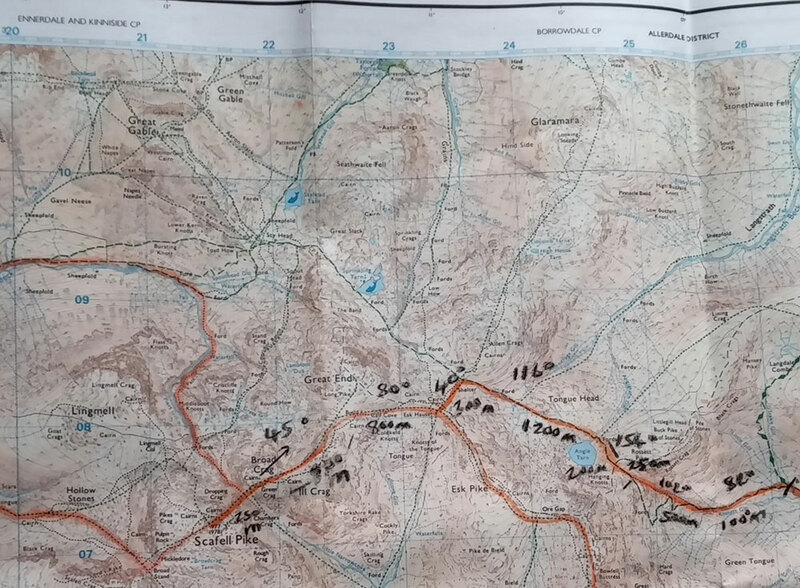 Map Exercise - look on your OL6 map and see if you can write down the grid reference for Scafell Pike. Your Bible is made up of 66 books. In each book there is a chapter and verse that was added by an English guy a few hundred years ago to help us. It's a good thing to get to know the Bible - where each book is; what kind of time they were written; who wrote the books and the purpose of their writing (apart from communicating God's truth). 2 Timothy 3.16 - All Scripture is inspired by God and is useful to teach us what is true and to make us realize what is wrong in our lives. It corrects us when we are wrong and teaches us to do what is right. This helps us understand the Bible and shows us that we don't read one verse apart from other verses around it or the Bible as a whole. Many people have ended up going very wrong and with some crazy ideas when they don't understand the Bible properly! Get to know individual Bible verses and even the verses either side of them. The Bible is like our 'road map'. It keeps us on track, helps us get to know God and to grow more like him. It tells us what God is like, what his will is. If we don't get specific direction that's OK because we use the Bible for guidance to help us make good, wise, God-like decisions. The Bible helps us make good life decisions in both small ways and in big ways. It also helps us get back on track when we sometimes get a bit off God's path. If we were out walking in the Lake District and we wanted to go from one place to another, we could use the map to see how we get from one place to the next place. One day we walked from the New Hotel in the Langdales in the Lake District to the highest peak in England called Scafell Pike. The route was about 12 miles (about 19km). It is marked on the map where we did lots of other bits of thinking before we went out so we all knew the route and all knew what to look out for. On the map route, you can see lots of things. 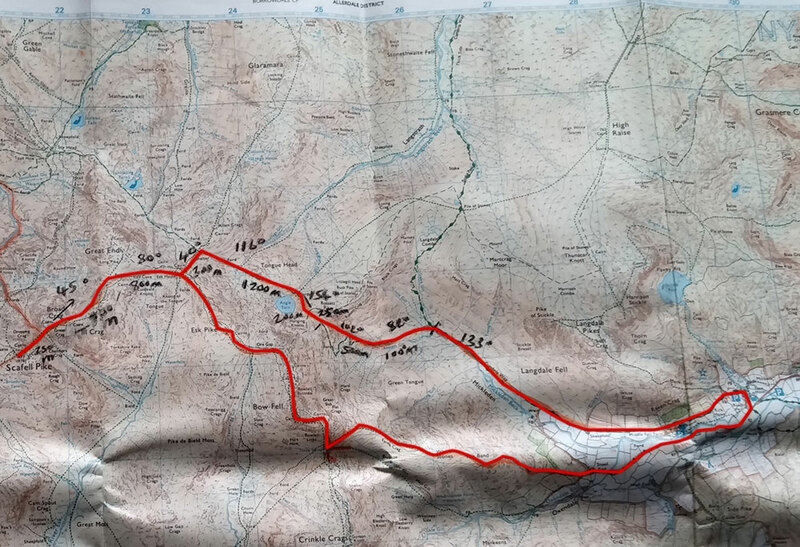 For example it shows where the route will be steep; where it will be flat; where there are cairns (stacks of rocks on the walk to help you know you're going the right way); little tarns (small lakes); the peaks of the Pikes (the tops of the 'hills'); rivers; paths; where there are lots of rocks everywhere. Especially important are things called the 'contour lines'. These show you the heights of different places. If you learn how contour lines work it helps you build up a picture in your mind of a walk. The left hand image shows the path we took; the middle picture helps you understand the 'contours' (showing it's steep either side of the path and that we are gradually going up); the right hand picture shows the route as if you were looking at it from the side. Where there are lots of 'contour lines' (little brown lines on your map) it tells you that it is very steep (you can also see numbers telling you how high the ground is in metres). If there aren't many contour lines it shows that it is flatter. Map Exercise - have a look around the big lake called Wast Water. What do the 'contour' lines tell you about the area to the right of the lake (to the east / south east)? Compare that to the white area to the left (west / south west) of Wast Water. The same is true with the Bible. It doesn't predict our every day life, but it has loads of help for us. It shows us that God has a plan for our lives (he knows the 'route' we take); it shows us that God is with us all the way; we learn that he's with us whether we're going up, sideways, on the flat or in the valley. The Bible gives us life principles we can use to keep walking forward and keep obeying God. It shows us some of the 'danger areas' like the edges of slopes that we need to avoid. God also promises to show us the path. It's good to think and pray about your life and the kinds of things you'd like to do. God has given you gifts and skills and a personality that is unique. You are one of a kind! God made you for a purpose - to love him, love others - but also has special things for you to do. So it's good to make plans, but always remember that it is God in charge and that we should always be open to what he wants us to do and not just do what we want! Proverbs 16.9 - "We can make our plans, but the Lord determines our steps." We said earlier that you can know the Bible but not use it in the right way. People who hate God will sometimes quote the Bible at you but will use the Bible the wrong way. So it's important to understand the Bible rightly! For example, did you know that Satan even knows the Bible? Take a look at Luke 4.10-11 where he even tried to quote them to Jesus. But he was using the Bible in a wrong way and for the wrong reasons. So it's very important to know the Bible and understand it properly. Otherwise you can go wrong. A man was looking for guidance from God and so he randomly opened his Bible, hoping that God would guide him. He opened the Bible at Matthew 27.5 which says, "So Judas threw the money into the temple and left. Then he went away and hanged himself." So the man looked for another Bible verse and randomly opened the Bible at Luke 10.37 and read the end of the verse which says, "Jesus told him, ‘Go and do likewise.’"
For the final time, he opened up the Bible for one more verse and it opened up on John 13.27, "So Jesus told him, ‘What you are about to do, do quickly.’"
So there's one example of using the Bible in the wrong way! If we use the Bible in the right way it will be like a compass for our life. A compass (in the Northern half of the world) is something that always points to what is called 'magnetic' North. The Bible points us to God - he is like our 'North' - the direction we should always focus towards! The compass is also like the thing that helps us understand our 'map' (the Bible). If we use our compass which points us to God then we can rightly understand the Bible as we won't do anything that points us away from God. If we look at our map and imagine that we want to travel between two places in a part of the Lake District called 'The Langdales' - from Harrison Stickle to Pike of Stickle. The way we use the compass is to point the compass in the direction of travel towards the place where we want to go. Keeping the compass still on the map, we then move the bezel (circle bit) of the compass so the lines of the compass line up with the North lines of the map. Ephesians 1.17 - I keep asking that the God of our Lord Jesus Christ, the glorious Father, may give you the Spirit of wisdom and revelation, so that you may know him better. Then when we travel, we line up the red arrow with the 'North' line on the compass and follow the 'bearing' we have on the compass (on the picture it's the direction of the white bit at the end of the compass). The compass has numbers on it from 0 to 360 (degrees). In our example, the 'bearing' we need to travel on is 258 degrees. We should always be looking to God to get his 'bearing' for our life - the things he wants us to do. And then sometimes we need to trust God, walk in faith and believe that as we go, he will guide us! Exercise - Can you work out the 'bearing' on the OL6 map between the cairn 'just north' of Great End - to the cairn 'just below' Broad Crag (to the south west of Great End). The Grid Reference for the cairn by Great End is approximately 225085. What is the grid reference for the cairn at Broad Crag? So if we walk 'on this bearing' then we will be able to go from Harrison Stickle to Pike of Stickle. The compass and the map work together. Along our journey we keep checking our compass and map. We also need to go around obstacles and things that block our way. This is like our Christian life where we keep focusing on God and walking towards him and obeying him, even when things get in our way. When friends let us down; when people take the mick out of us; when we do wrong things or when painful things happen - all this time we keep on going, walking on the 'bearing' (the direction) that God has given us. Genesis 6.9 - Noah was a righteous man, blameless among the people of his time, and he walked faithfully with God. John 17.17 - (Jesus prayed to God)... Make them holy by your truth; teach them your word, which is truth. First of all, it's time to get serious about your Bible. Will you commit to read it every day? Second, it's time to get right with God if you feel God has told you you're doing something wrong or maybe you haven't done something he told you to. (If you don't feel anything that's fine. God will show you, don't feel any pressure). "Jesus, teach me your truth. I want to know the truth. I pray that you would shape me and change me so that my life will be like Noah. I want to be someone who does what is right and who will walk faithfully with you God all my life. Amen. 1. The answer for the exercise under the 'Open Your Map' section for the Scafell Pike Grid Reference is: 215072 (or 216072). 2. 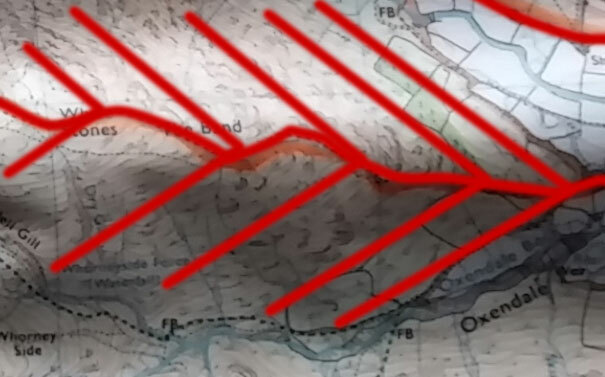 The answer for the exercise under 'Directions From Your Map' section about Wast Water is that there is a very steep slope to the east / south east of Wast Water. To the west / south west the slope is not as steep. In fact in the white area on the map it is fairly flat. 3. The first answer for the exercise under 'Compass and Map' section about the bearing is: somewhere around 216 degrees. (10 degrees either side is fine!) The second answer about the Grid Reference for the Broad Crag cairn is 218075 or 218076.